Hand dryers have come on leaps and bounds since the first concept in the 1920s due to how far technology has evolved. Long gone are the days of slow, manual hand dryers, as modern day products are now made to specific hygiene, speed and noise guidelines. The inefficiency of the first official hand dryers invented by George Clemens in 1949 meant that they had to compete against the traditional paper towel, and consequently lost. Bulky, loud and slow machines couldn’t compete against the quick and simple paper alternative. However, concerns about the environment have made demands for more environmentally friendly ways of drying hands, which is an area that paper towels fall down in. Energy efficiency is at the top of many of our customers’ priority lists, particularly for commercial customers who are looking to minimise both cost and carbon footprint. 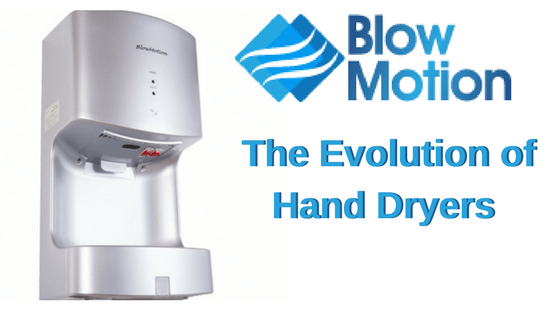 Here’s how hand dryers have evolved over time in the categories of speed, volume, hygiene, and energy efficiency, and how Blow Motion products are at the top of their game! We’re always thinking ahead and trying to keep our customers’ needs in mind. Wherever you’re using a hand dryer you’re probably in a rush and want to spend as little time in the washroom as possible. Hand dryer technology is constantly developing to become super fast and The Ninja is a perfect example of how far the industry has come after decades of innovation. Its design and speed makes it stand out amongst the competition. 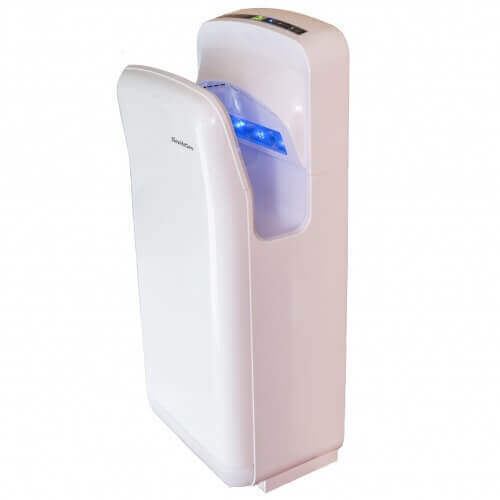 Its super fast drying speed of just 12 seconds complete drying time makes this hand dryer a popular choice. With its dual jet blades, both sides of your hands are dried simultaneously and evenly, simply place your hands in the illuminated drying zone and let the hand dryer do all the work for you! Hand dryer design has changed significantly over the years, as you can see with the Ninja, with its modern, sleek design helping it to blend seamlessly into contemporary buildings. The obnoxious volume of older hand dryers was a deterrent for many people, however, there are now much quieter products on the market and Blow Motion have some of the quietest there are! Our Cyclone is an all rounder. It’s super fast, eco friendly and has a very low noise level of just 72db. Quiet hand dryers are perfect for places such as schools, hospitals, libraries and the workplace. Best of all though, despite their lack of volume, they don’t compromise on speed. The Cyclone has a drying time of just 10 seconds! One of the main purposes of hand dryers is to rid your hands of germs from the washroom, so hygienic hand dryers are an important category. Products for commercial use in particular need to have hygienic qualities as they are usually placed in large spaces with lots of traffic such as restaurants, hospitals, schools, and offices where hygiene is vital. All Blow Motion products meet strict hygienic standards and we have been RoHS and CE approved. The Ninja, however, is the perfect hygienic hand dryer. It has a HEPA filter which filters bacteria from the air and the waste water tank collects water which can be disposed of hygienically. Nowadays, caring for the environment is a priority and many people are focused on reducing their carbon footprint. Here at Blow Motion we want to play our part and create environmentally friendly commercial hand dryers. All of our hand dryers are energy efficient, but we recommend the MX2000 as it can dry around 100 pairs of hands for just 2 pence worth of electricity. 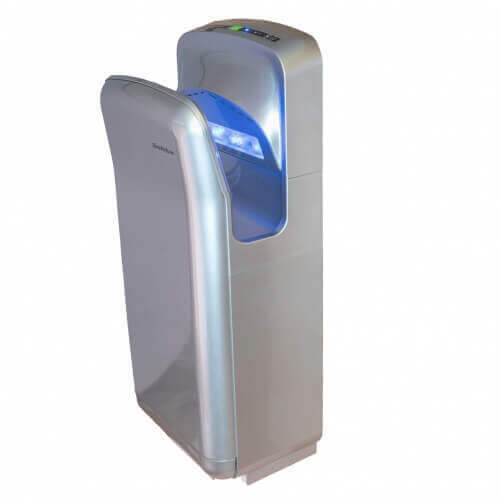 This is a great commercial hand dryer as it can be used by a large amount of traffic whilst being cost and energy efficient. The MX2000 is unrivalled when it comes to energy usage as it’s 75% more energy efficient than most of the competition whilst still having fantastic drying times! The majority of our products include all of these qualities which clearly demonstrates the evolution of hand dryers. You no longer have to compromise on speed for discretion, or power for eco-friendliness. 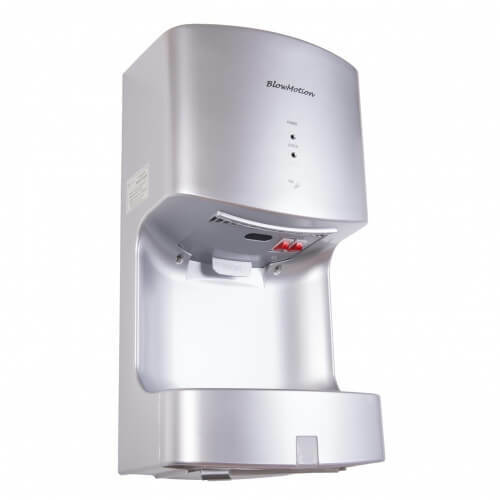 Blow Motion take into account all of these qualities to deliver excellent quality hand dryers at an affordable price. Browse through our wide selection of products today and give us a call on 0800 002 9678 when you find the product that’s right for you!